T191, which is one of the youngest phone in the new line from Motorola, is not the simplest one. Design of the new phone is considerably different from usual squared phones from Motorola. As for me, I liked this design, though an antenna has different color from the phone. The handset is available in 3 colors – blue, silver and dark-brown (standard ones). Rim of the screen, keys and rear cover always remain silver. The phone has compact dimensions – only 120 x 42 x 18 mm, and weighs 98 gram. Originally it was planned to equip the phone with a lithium-ion battery of 550 mAh capacity, but at last it was decided to put Ni-MH battery of the same capacity to reduce primary cost. According to manufacturers the phone has up to 80 hours of stand-by time and up to 1.5 hours of talk time. In reality it worked about 2 days in case of 3-5 minutes o talking per day (in Moscow). Time of full re-charging is about 2.5 hours. A phone with a Li-Ion battery, which also substitutes a rear cover, will be delivered only to Asiatic market. Such phone construction is quite reliable. SIM-card holder is usual. Keys made of plastic are pleasant to touch. They have a green backlighting, which is visible in all lighting conditions. Alphanumerical keys are small and space closely to each other, what is not very convenient. When you dial a number, you can touch other keys and even accidentally press them. Two soft keys and 2-way navigation key are used to control the phone. Graphical display has a resolution of 98x64 pixels and enables to display up to 4 text lines (16 characters each). The screen has light-emitting diode backlighting, which is rather bright. Such information as the signal strength level, battery status (4 points), date and time, local network and icons to the soft keys (phonebook and quick access to wap-browser) are displayed in the stand-by mode on the screen. A central key placed under the screen gives an access to menu. . Menu structure is rather simple. You have two rows of icons (totally 8). When you select one of them, you can see a tip to this icon. Each menu item has a special number, which enables to use shortcut number navigation. Unfortunately, you can’t see numbers of menu items on the screen, and at first it will be necessary to remember them. Besides, there is a possibility to set up to 9 shortcuts, which provide quick access. Phonebook. 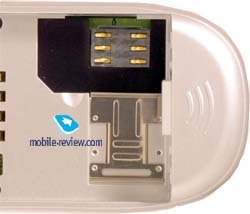 Up to 100 phone numbers can be stored in the internal memory, the same quantity of numbers can be kept in SIM-card memory. Only one phone number can be added to one name. It is possible to input both Russian and English text. Predictive text input is available in the latest versions of firmware. Length of the name can’t exceed 15 characters (phone memory) and the longest phone number can include 20 characters. There is a possibility to add a voice tag (up to 10). Voice dialing is activated with a help of navigation key. Five caller groups are available in the phone. A special icon, ringing tone and type of incoming alert (melody; melody + vibracall; vibracall, then a melody; silent mode) and a special SMS-tone can be assigned to each group. Totally up to 27 ringing tones are pre-installed in the phone, a user can also add 5 of his/her own ones. You can copy one or all records from you phonebook (phone memory) to SIM-card and vice a versa. But it is impossible to work with both memory types simultaneously. Up to 10 received, missed and dialed calls with date and time indication can be stored in the phone memory. It’s pleasant that you can view a missed call without unlocking a keypad (then, it is automatically switched on). To turn a keypad lock manually, press # key and to turn if off, press first right soft key and then *. Messages. Here you can read and create SMS-messages. Up to 20 standard templates, which can’t be changed and 5 empty fields to input own messages are kept in the phone. There is also such function as SMS Chat. Besides, the phone supports EMS standars, which enables to send and receive icons, graphics and melodies. There is a set of 25 pre-defined animated icons, which can be sent in a message. By the way, the phone also supports concatenated messages (up to 765 characters each) (only in English). One of the interesting features of this handset is autopower, which can be once and recurrent. It means that the phone can be automatically switched off/on in special time. Nice animated screen saver with a crocodile, which catches a spider is pre-instlalled. There is also a possibility to set up to 5 extra screen savers. Settings of wap-browser (in version 1.1) are simple and understandable. An alarm-clock works even when the phone is switched off, it can rings daily or only one time. Unfortunately, it is impossible to change an alarm-clock signal. The feature of automatic time control (the phone automatically compares time on the phone with time in the local network) can be very helpful during the trips. Every hour the phone beeps and reminders about itself. I am not sure that it is a necessary function, but may be someone will use it… There is also a calculator and stopwatch in the phone. You can view all data within the month in the organizer (calendar) and input small records to each date (up to 19 characters). Sound signals can be set as reminders. So, everything is very simple. At last, few words about the games. There are 6 pre-installed games in the phone: Snake, Tetrix, Numbers, Bricks, 5 stones and Box World (logical game, which has many levels). As for me, the most captivate is the last game, others are standard. T 191 has an acceptable quality of connection, irts sound is a little bit muffled, but it is difficult to expect excellent quality from the phone of the entry class. It seemed to me that the level of signal strength is comparable to such phones as Alcatel 301, Panasonic GD35 or Motorola m3788. Vibrating alert is average, though volume of the ring is loud. The phone has various features, some of them can’t be even found in more expensive models. The phone is balanced, it has many games and gives possibilities for personalization (5 own melodies and screen savers). Namely these functions are appealed to those, who purchase this kind of phones. 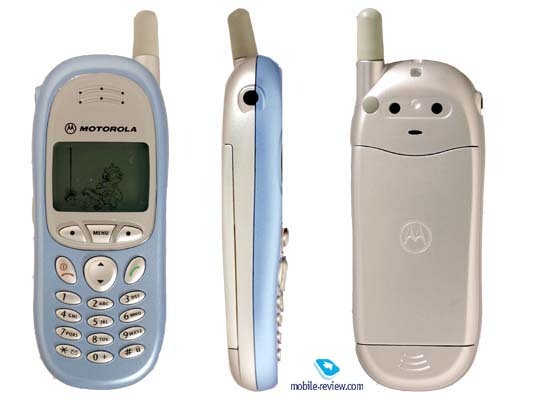 T191 is the youngest model in the phone line from Motorola. In the beginning of sales the price was 110-120. The phone has an attractive design and advanced features, so, it is very popular among users of low-end phones.